Samuel Gilliney was born in Rainhill in 1886, the son of Peter and Jane Gilliney. They lived in Holt Lane and later at Parr’s Cottages. By 1911, Samuel was married to Sarah with a two year old daughter and they were living with his brother and family at 38, Cumber Lane Cottages. He was 25 and a coal miner (hewer), working at Lea Green Pits for seventeen and a half years before the war. When Samuel enlisted at Liverpool into the Army he was living at Parker’s Row, Rainhill. He enlisted on 5th August 1914 and became Sergeant 308110 in the Royal Garrison Artillery, 1st/2nd Lancashire Heavy Brigade, (R.G.A –TF). Samuel had been in France for eighteen months before he died from wounds received on 4th April 1918, aged 32. He is remembered on the Pozieres Memorial and buried at Piquigny British Cemetery. In 1917 Samuel had been awarded the Military Medal. In February 1918 he received the bar to his medal and was recommended for the D.C.M. Samuel Gilliney is buried in Picquigny British Cemetery, plot A14. All but four burials in this cemetery are from April 1918 when the 5th and 46th Casualty Clearing Stations were brought to Picardy to deal with the casualties of the German advance on Amiens. Gilleney Grove on the Sandstone Estate, Delph Lane, Whiston is named in honour of Sergeant Samuel Gilleney and his brother Thomas Gilleney who died of War related injuries in 1918. Both Samuel and Thomas are remembered on the WW1 Memorial in the grounds of St. Nicholas' Church, Whiston. 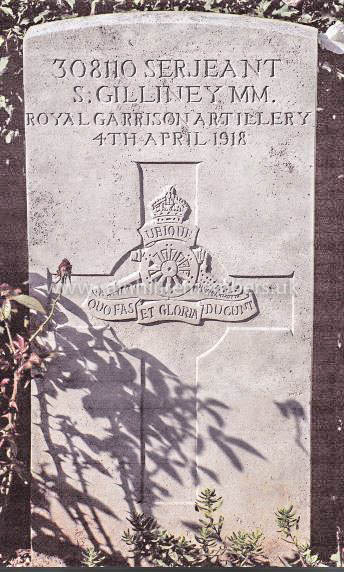 The CWGC Headstone in Picquigny British Cemetry commemorating the death of Sergeant Samuel Gilliney. Inscription from the book of Remembrance at Picquigny Cemetery.